She is my first brew by champion. I did not even dream that her mother and father can surprise me like that. Her parents are both healthy, happy frenchies. I could not even imagine that it was possible. At that time, I was looking to possibly add a show dog to my family. Meanwhile, I bred her father to her mother. The health tests were done, all came out good. So, I did. Three puppies were born. One boy and two girls. I decided to keep both girls. Time went buy and Pepper remained very small, and just being Pepper – happy, barking, personable. I have realized as the time went by, that she is developing into a very nice young lady. I have shown her to the handler, but he said she was small at the time. Another year went by, I showed her myself, and of course, did not get anywhere. But Pepper’s confidence was building up. Pepper turned 3 and I realized that she bloomed even more. I have shown her to another handler and the rest is history. She went on and she won, she won again. 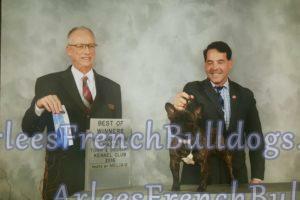 She won two french bulldog specialities, several other big shows. Three months later, she had to be pulled back from the show because she was bred. She was bred to a beautiful, remarkable Champion Frost. She had a beautiful litter. Fast forward, she had to go back to the show ring and get one major which she was missing. She went on and finished with a 5 point major. 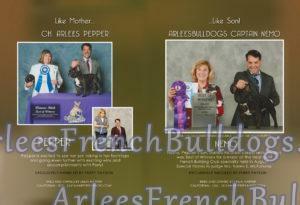 She did not only excel in a show ring, but she is also a mama of 3 beautiful show boys. One is already a Champion. He went to the same shows as she did, but 2 years later.He excelled at those shows and became a champion in 3 months. Pepper showed me over and over again, that anything is possible. 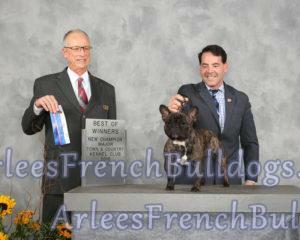 I never dreamed before that I am able to breed a champion. Here I am now.